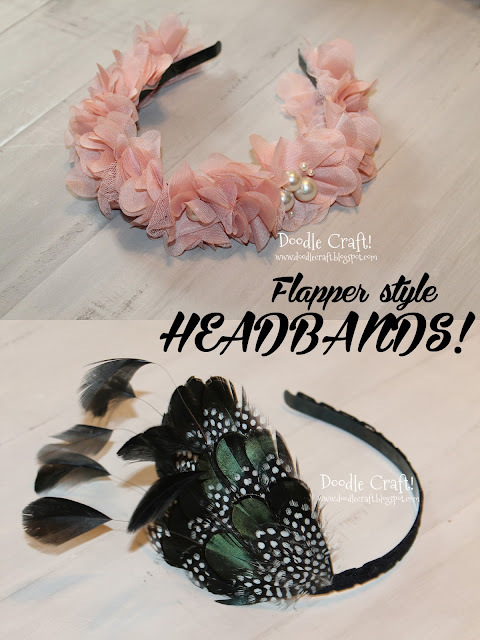 Doodlecraft: Feathers, Pearls and Flowers! Flapper Style Headbands! Feathers, Pearls and Flowers! Flapper Style Headbands! I got this fabulous feather embellishment from Wholeport for $6. They have a big variety...peacock feathers too! I used a metal headband and some stretch lace. I fit it to my model and marked where I wanted the feathers to sit. Then I put a strip of hot glue on the felt backing of the feathers. Sort of a 20's flapper feel...modernized. Next is the whimsical flower and pearl headband. I was sent this yard of chiffon flower trim from Wholeport! I used a wide metal headband form, just like the feather headband. I began by hot gluing the flowers around the headband. I didn't even measure...but I used all but 1 flower on this! #1. Put the glue on the headband, not the flowers themselves. if you apply glue to the flower itself. the rosettes like pictured. Take advantage of that extra texture. Then I just hot glued on some varying sizes of pearl beads. Sort of a Fairy flower girl look...she loves it! have the honor of crafting with them. selection of crafty things at great prices! Like these cheap lace collars! Fabulous stylin' headbands! Perfect princess accesory! Mahalo for sharing.